These cheap guitar combo amps are especially for gigging guitarists who want a professional, efficient stage setup on a tight budget (see the practice amps section for smaller combos). The picks below are conveniently lightweight and portable yet loud enough (40 - 120 watts) for most gig venues. 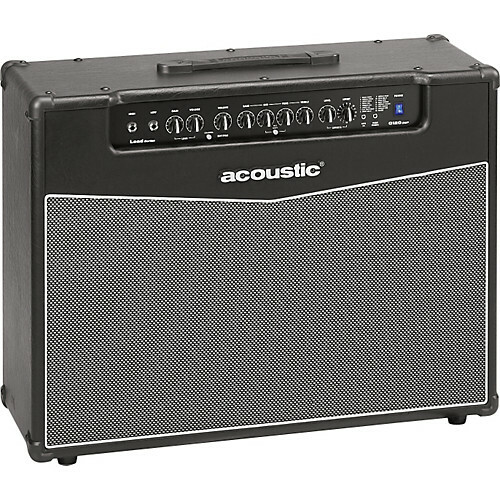 Many combo amps in this price range (under $350) can sound sterile and flat. Not these ones! They represent exceptional value for money and deliver rich, vibrant tones with the zero-fuss reliability of solid state electronics. If you are, however, specifically looking for full tube amps and willing to pay a bit more, take a look at the tube combo amps section. Defining Features Basic operation. 2 independent EQ channels. 100 presets. 17 amp models. USB connectivity & FUSE software for deep editing. LCD display. 300 presets. 16 amp models. Artist inspired tone bank. Looper. LCD display. 4 channels. Classic controls for FX & amp models. iOS connectivity. Settings memory bank. Basic operation. Mid-frequency control. 11 effects. Two speakers. Tube-like tones. Very loud. 1 x 12" 1 x 10" 2 x 12"
The oldest of the five amps featured here, and the most basic, with reverb being the only on board effect. However, you may prefer a no-nonsense setup, especially if you have your own pedal board. Saying that, the Envoy is by no means feature starved, with two independent, EQ-able channels and additional tone modifier switches for each, giving you plenty of range from vintage cleans to hi-gain distortion. The boost control also gives your solos that little extra push if needed. Users agree that there's enough versatility to cover most styles of music and the distortion can reach brutal, overkill levels. One consistent criticism is it can get a bit noisy, especially with the gain cranked. However, in a band setting, even at a modest 40 watts, it'll sit with the drummer no problem and any white noise will be crushed. The independent EQ for each channel is a welcome bonus, allowing you to dial in your clean and dirty tone with the precision that other amps on this page can't quite offer. This feature alone, even without the on board bells and whistles, will make the decision for a lot of players on a budget. 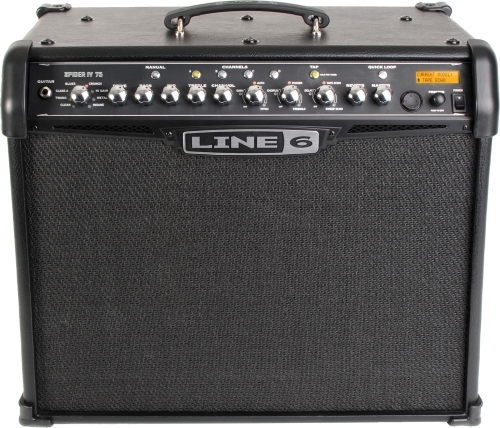 A rugged, reliable and portable amp for both practice and the working/studio musician, for well under $300. A more hi-tech, feature rich combo, with 17 amp models, 100 customisable presets and an impressive bank of 44 effects, including more sophisticated effects such as auto-wah and pitch shifting. The addition of an on board tuner means you literally have everything you need in a single unit. There's even a USB port to connect the Mustang to you computer and use the included FUSE software for deeper, more expansive editing and access to community and artist presets. So there's a lot to play with here, and it's true that, to many, it will just seem overwhelming. But Fender have clearly put a lot of time into developing the usability of such a rich and complex array of on board features. The modelling/preset controls are clear and the intuitive menu is visualised through a small but bright LCD screen. Users are impressed by the emulation quality of the amp models and stomp boxes. If you have a specific sound in mind, given some patient tweaking, you will find it on the Mustang. At 100 watts, driven through a 12 inch speaker, you have more than enough power for small-mid size venues and loud practice sessions. But the cabinet itself is nicely compact and lightweight. Even if you only end up using a couple of effects and distortions, at $330, the value for money is incredible. This is a 75 watt modelling amp boasting over 300 presets, 16 amp models, 20 industry standard effects and up to 64 of your own creations, building on what made the Spider III range a best seller. The Spider's key feature is its "rock star" inspired tone bank - 200 tones based on popular guitar songs over the past 60 years, from vintage jangly cleans to melt-your-face-off modern metal distortion. Granted, not all the presets sound great, but there's a lot to discover based on your own personal tastes and you can even create your own sounds. The amp models give you authentic tube replication and complexly layered, compressed tones resembling valve legends such as the Marshall JCM900, Vox AC 30 and Fender Twin/Deluxe - not the real thing, but damn close. You can also tap in many effects such as auto-wah, chorus, phaser, delay, reverb and a looper allowing you to record up to a 14 second riff and then play over it. The frontside LCD screen gives you a visual reference as you scroll through the hundreds of presets, set the parameters for your own sounds and tune up using the onboard tuner. 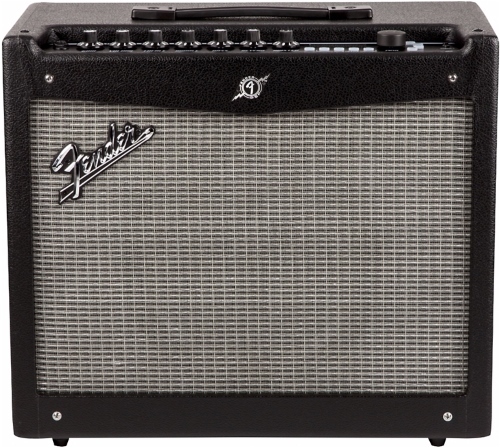 Like the Mustang, it will take a while to truly get to know all this amp has to offer as it has pretty much everything covered, but on the surface it's loud (stays clean at high volumes as well), versatile and solidly built. Note that if you'll be gigging with this amp, you'll most likely want to purchase the separate footswitch board (with expression pedal), allowing you to switch between effects and the four (yes four!) channels remotely. The now famous Cube series has been updated with the relatively new GX line. More modestly equipped than the Mustang and Spider, but still generous with its on board features, controlled through a more traditional knob interface (no LCD screen on this one). For the effects, you have three controls - EFX, which delivers tone modification effects such as chorus, flanger and heavy octave. Then there's a delay and reverb knob each offering their own presets. A single volume control occupies the first, "JC Clean" channel, modelled on the Roland Jazz Chorus, famous for its pristine cleans. 10 more authentic amp models (including Vox, Fender and Marshall), are accessed on the second Lead channel. The third "Solo" channel acts as a memory bank, allowing you to save and recall settings. There's a reliable consistency about Roland amps and effects that many users like. 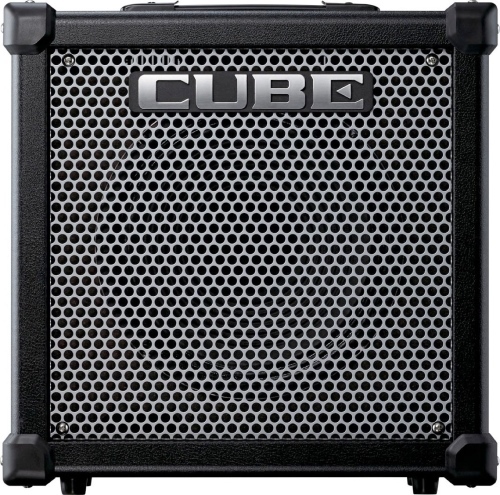 It's not hugely tweakable like the other modelling amps, but if you've ever used and enjoyed Boss (a Roland subsidiary) and COSM based technology before, you'll not be disappointed with the Cube. The i-Cube Link port, which is basically a fancy aux-in, provides interfacing with various iOS (Apple) devices, if that's your thing. So there's a mixture of modern digital functionality with more classic on board controls, in true Roland style. And while 40 watts through a 10" speaker might seem a little weak for gigging, this is a surprisingly loud amp that certainly shouldn't be confined to the bedroom. 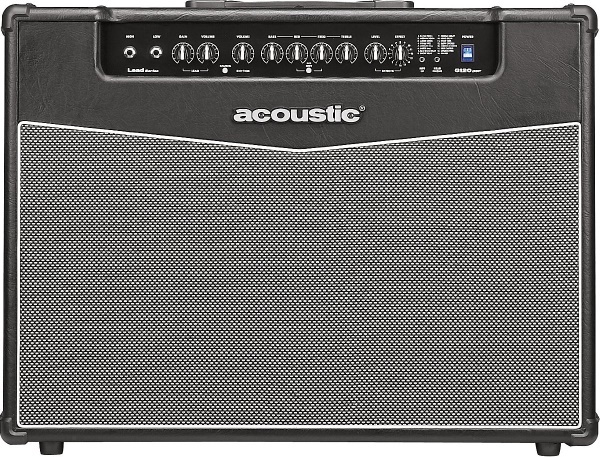 By far the most powerful amp in this top five. 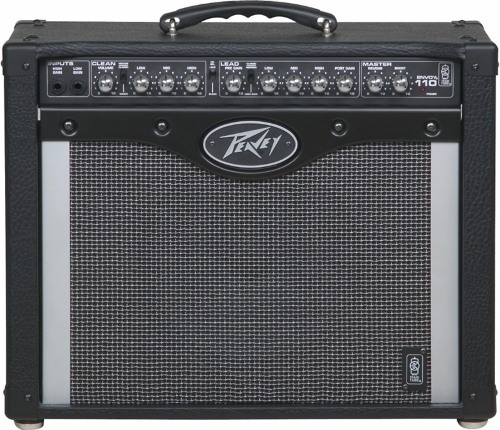 120 watts of solid state power drives two 12 inch speakers, with basic operation similar to the Peavey Envoy. However, the G120 has the bonus of 16 on board effects, accessed via a single control knob and an effects loop input/output for adding your own stomp boxes if needs be. The two channels are independent, but unlike the Envoy, the EQ is shared, with only a single volume on the clean channel and a volume + gain on the lead. The EQ has an optional mid frequency control, allowing you to "scoop" the mids a bit more, which will please those looking for dark jazz tones or, at the other end of the spectrum, Pantera-esque metal mayhem. The dual 12" speaker does give the G120 a certain warmth and depth that the single speaker combos on this page lack. Many are impressed with the clarity and tube-like character of the tone. Only the effects perhaps let it down, being good enough to "do the job", but nowhere near the sophistication of the modelling amps. But even if you never touch the effects knob, you have a loud, solid combo amp that will drown out your drummer with plenty of head room to spare. At just shy of $300, the G120 represents the most watts-per-buck in its price range, and simply great tone to boot.